Saguaro National Park – Let's Go RVing! We got an early start today and headed to Saguaro National Park, our sixth national park on this trip. A stop at the Visitor’s Center gave us the information we needed so we headed out to drive the eight mile Cactus Forest Loop Drive. It is a paved narrow one way road that we shared with a number of cyclists. 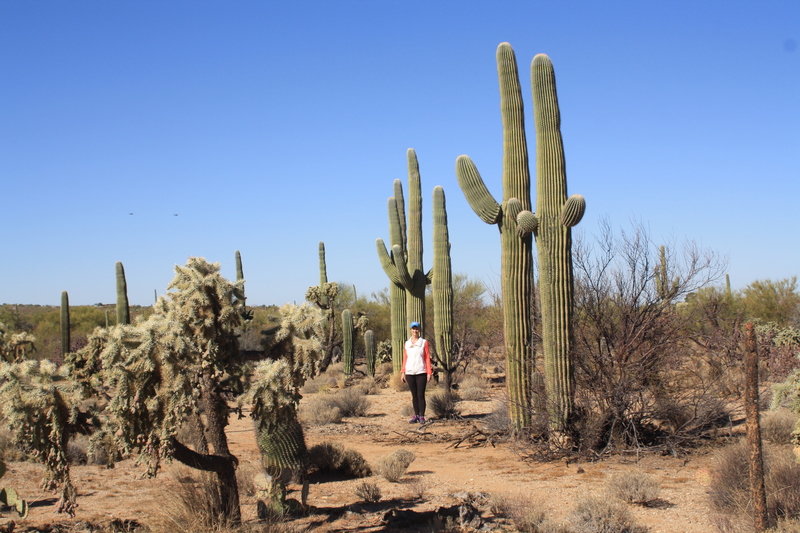 We were absolutely astounded at the bountiful saguaro, the cholla, the mesquite and the beautiful palo verde trees. We stopped along the way to photograph some of the stunning landscape. We arrived at the Mica View Picnic Area where we began our two mile loop though the desert beauty. Initially we were on a paved path but it turned into a sandy, dirt path. I was fine with the hiking until I saw the warning about rattlesnakes and mountain lions. Jerry said later if he had seen a rattlesnake it would have made the morning perfect. I’m not so sure I agree with that. One thing of particular interest to me was seeing the young saguaros under their palo verde “nurse tree”. Unfortunately we didn’t get a picture before we turned off of the pavement and we didn’t really see anymore. As we hiked the Cactus Forest Trail we both noticed that the vegetation seemed to changed. Since it was a bit higher and closer to the Rincon Mountains we wondered if possibly there was less water there. Who knows? We are aware that Arizona is in a severe drought and it has been mentioned often as we’ve traveled. They have not had any rain during 2018 plus very little snow, meaning no snow melt from the mountains. With the summer months of May, June and July being the dry months it’s a bit frightening to think about the possibility of fires. In addition I read today where Arizona is the lightning capital of the United States. It could be an anxiety ridden year. Guess he got tired of me asking him to smile. 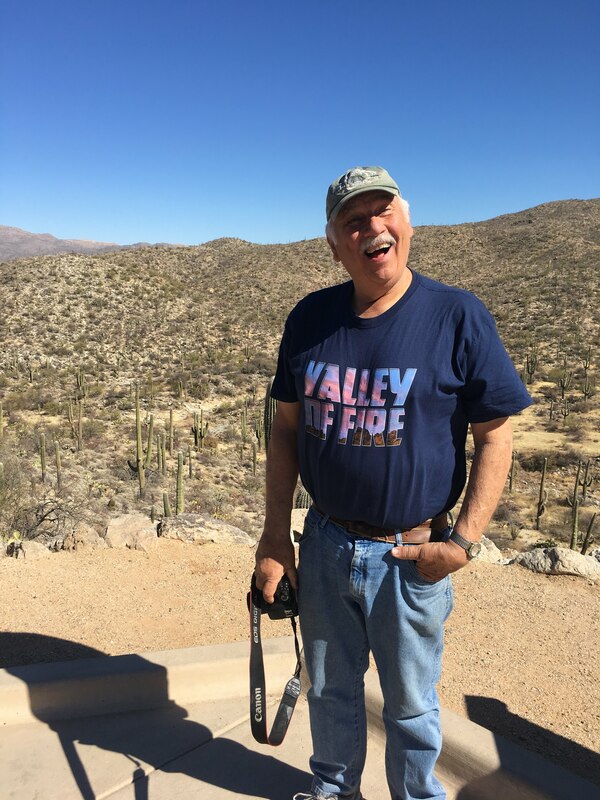 After our hike we continued our drive around the loop stopping occasionally to view the beautiful Rincon Mountains and trying to determine how far up the mountain side the saguaros continued to grow. It is amazing to realize that we have visited six national parks in relative proximity to each other yet they are each so very diverse. Within just a few hundred miles are examples of such different life zones. In fact in the Saguaro National Park there are six different life zones going from the desert lowlands to the pine zones at the top of the Rincon Mountains. Along the way hikers might eve encounter animals not usually associated with the desert such as foxes and black bears. Rattlesnakes, mountain lions, black bears – reminds me of “lions, tigers and bears, oh my”! After completing our drive through the loop road we continued on to the Sabino Canyon Recreation Area, part of the Coronado National Forest. As soon as we arrived we found a shady place and had our picnic lunch then went in search of information. We decided to ride the tram up the nearly four miles instead of walking hoping that perhaps we’d walk back down. After the first descent on the tram Jerry looked at me and said, “Nope, riding back”! The tram driver provided a very informative narration on the 25 minute drive up and answered one question Jerry and I had. Earlier on our trip we had seen some trees with completely white bark but we didn’t know what they were. We found out today that they were Arizona Sycamores. The trunks are so white they look almost painted. Fortunately we sat under the shaded section of the tram and the ride up was very pleasant as the driver pointed out different points along the way. At the top we got off of the tram, took some pictures and then trudged up a slight trail going toward the Pusch Ridge Wilderness. We didn’t go very far before we decided that it was too hot for hiking so we just sat down on the trail and enjoyed the scenery. Soon a tram came up and we hopped on and rode back down. After getting our Passport book stamped we headed to the car. Since I had brought nothing but turtlenecks and cold weather clothes we did a little shopping for cooler clothes and then stopped at Walmart for some groceries. Earlier Jerry had suggested that we have a steak and I added French fries. We haven’t had a meal like that since we left home. When we got back to the coach it was warm but as with yesterday the wind was blowing and with the windows opened and the exhaust fans on it cooled off very quickly. Since we are still dry camping we are still trying to conserve so it was an early night.